I have been on a major grilled pineapple kick lately. Like, mayjah. Guacamole, burgers, margaritas, and of course – those nachos. The other two people in this house are not so… passionate about grilled pineapple. There have been eyerolls and little remarks and sighs. Nor are they passionate about taking the contents of 5 leftover bowls from the fridge and making… that. But those other two people in this house didn’t complain one bit about dinner last night. The Internet’s favorite queso serves as the cheesy nacho base, which I then topped with leftover chicken tossed with barbecue sauce, grilled pineapple, thinly sliced red onion, weapons-grade-hot chopped jalapeno (but only on half – Thank, God!) and cilantro. OF COURSE THEY DIDN’T COMPLAIN. 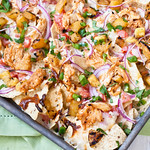 Cheesy nachos topped with barbecue chicken, grilled pineapple, and red onion. *Slice fresh pinepple 1/2-inch thick, remove core, and grill over med-high for ~5 minutes a side, until charred. 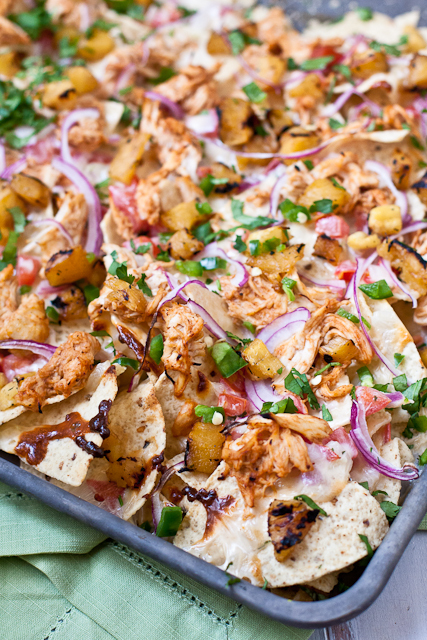 Spread the tortilla chips on a large baking pan. Toss the shredded chicken with barbecue sauce in a small bowl. 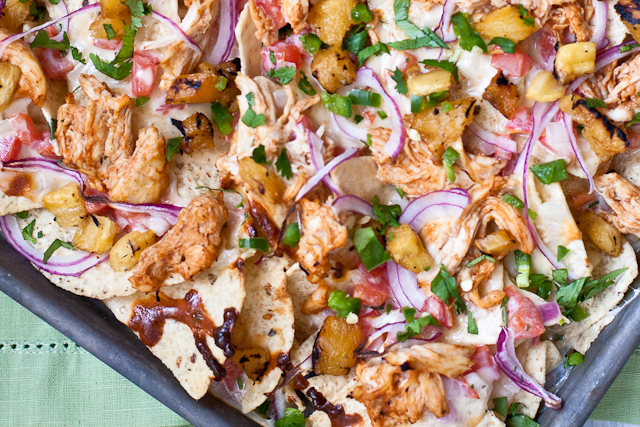 Top the chips with queso, barbecue chicken, sliced red onion, and diced pineapple. Bake for 7-10 minutes and remove from oven. Top with jalapeno and cilantro, serve hot. Completely & totally head-over-heels in LOVE with these! These must be the prettiest nachos I’ve ever seen! Yum! Oh my goodness, does this ever look delicious! Grilling season is finally in full swing here and I can’t wait to give these a try, I don’t have nearly enough gourmet nachos in my life. ; ) Pinned! Omg. I’m on this weird kick where the only pizza I’ll eat is the hawaiian bbq pizza from Papa John’s. So this is basically it but on nachos. I need this in my life. Right now. Why must I be on a diet? I’ve been on a nacho craving kick lately, and these are simply amazing!!! Yummy! Chicken and pineapple is one of the most delicious combinations! I have not grilled pineapple in a very long time. Long overdue from the look of these nachos! As soon as you mentioned weapons grade jalapeno being paired with sweet and caramelly grilled pineapple…I was in. Yum! Wait, there are people who don’t like grilled pineapple?! Madness! 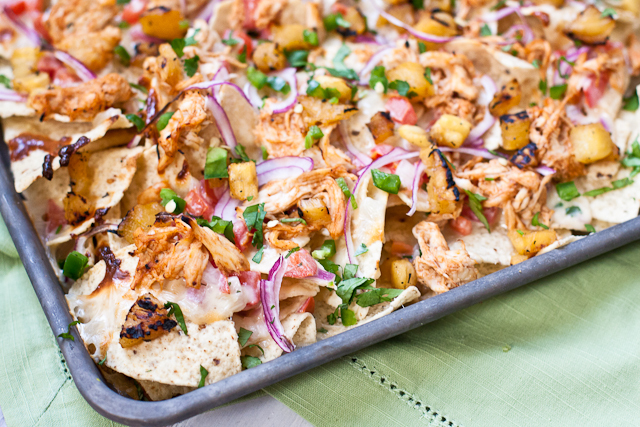 These nachos are making my mouth water – they look fantastic! !